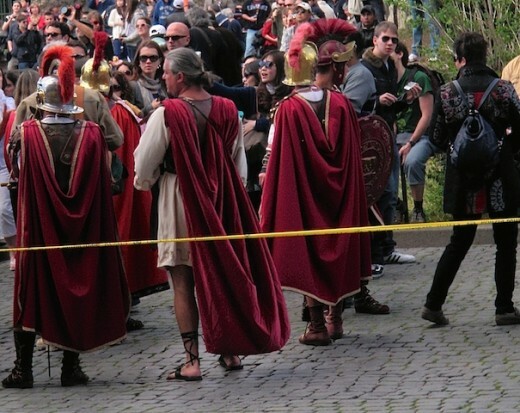 What to do in Rome (Part 1). When in Rome – do as the Romans! 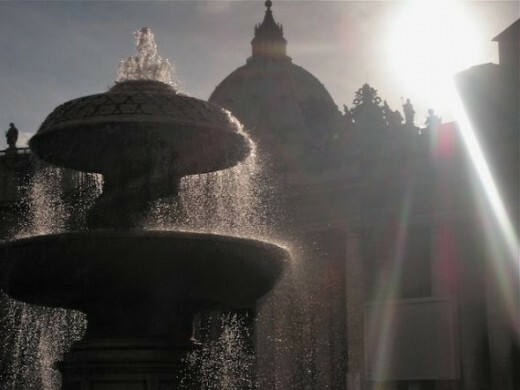 This article is about what do in Rome… a big topic so this is part one of a three part series. Rome is an awe-inspiring city and you cannot possibly see it all just one visit. But this is what we did when we were there for 5 days introducing our 13-year-old son to Rome: the most romantic city in the world. A good guidebook is essential and I have made some recommendations below. I have personal reasons for loving Rome because it’s where my parents met. So to me Rome is all about being in love! One of the first places we visited was where my mum used to go to get a glimpse of him when he stood guard at the Monumento Dei Caduti. (Tomb of the Unknown Soldier) at Il Vittoriano. 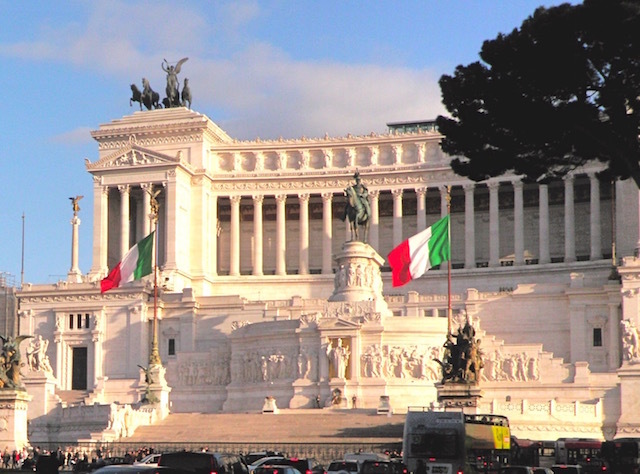 That’s the big white marble building that looks like a wedding cake and totally overshadows the Piazza Venezia. In my opinion it’s a monstrosity! 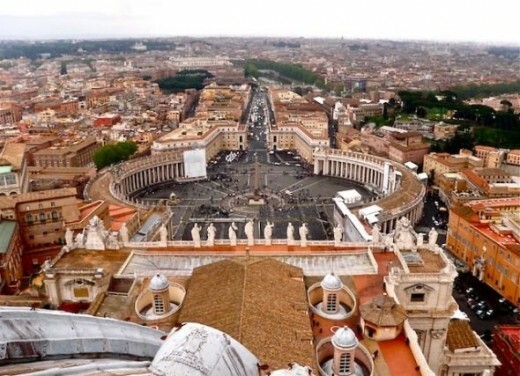 They started building it in 1885 in honour of Italy’s first king, so it has absolutely nothing to do with Ancient Rome. However it was an extra special place for us to visit. It houses a couple of small exhibitions about the unity of Italy and it’s worth a visit if you have time. It must have been the wettest day of the year when we were there! We got drenched through. Everyone was in coats, macs, and flip-flops! Broken umbrellas were flying around in the strong wind. The soldiers standing guard wore ponchos and tried very hard to avoid being blown away! Marble is really slippery when wet, so watch out when you visit the monument if it is raining. 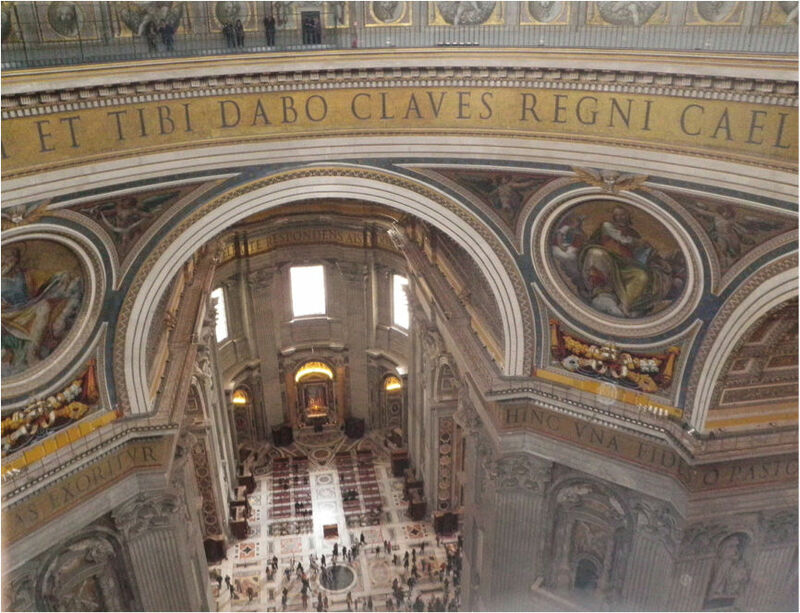 Another place my parents loved was the dome of St Peters. They went up to the very top and carved their initials in the stonework, as many other lovers have done over the years. St Peters is an Italian Renaissance church in Vatican City, the papal enclave within the city of Rome. We found it very easy to get there by tube and got off at Via Giulio Cesare and walked along Via Ottaviano, (romantic sounding names!). We passed guides selling tours of the Vatican to tourists, and we followed streams of pilgrims heading towards the home of the Catholic Church. Although there were so many people in St Mark’s square, the atmosphere was calm and strangely surreal. We were surprised that we had to go through airport style security checks when we arrived at the huge piazza, until we saw why; the Pope himself was standing in front of the huge crowd saying mass. We certainly were not expecting that! Then an even more extraordinary thing happened – he blessed us. The atmosphere was amazing, it was Easter and the stairs on the beautiful piazza were adorned with thousands of yellow spring flowers. People had come from all over the world to celebrate. They were happy and waving flags, and some were moved to tears by the whole occasion. Then the pope got in his Pope Mobile and drove off! 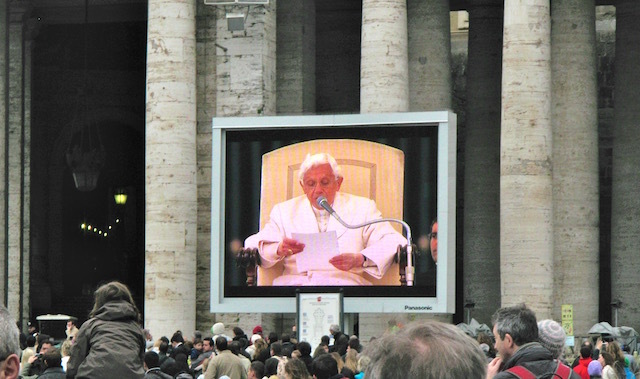 This was the 265th Pope, Benedict XVI. It’s odd to think that just a few months later he was flown off in a helicopter never to return! We queued for quite a while to get into St Peters but it was worth every minute. 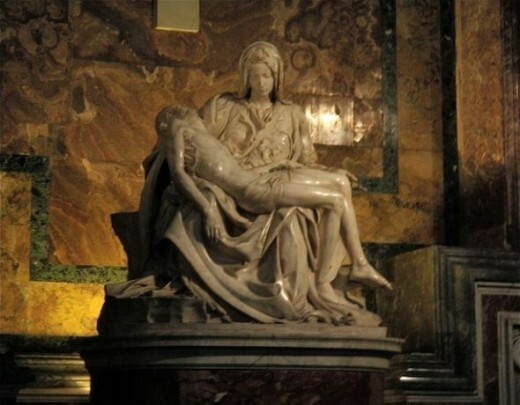 It is crammed full of incredible art; La Pieta, Sistine Chapel the wonderful mosaics that look like paintings, wonderful marble statues. It’s dark inside, a heavy darkness that keeps out the heat of Rome in summer. Getting to the top of the dome meant climbing a spiral staircase. There is a lift, which takes you halfway up and a warning sign telling you not to attempt the climb if you suffer from a weak heart! It’s a nice wide staircase at the start, not too claustrophobic. However, halfway up it narrows – a lot. Until you arrive at an opening, a little piazza where you get a view of Rome and we found ourselves actually standing behind the enormous statues of Jesus and the Apostles that look down onto St Peter’s square. It already seemed quite high up. From there you go back into the church and can walk round the base of the dome. The view is down into the interior of the cathedral. 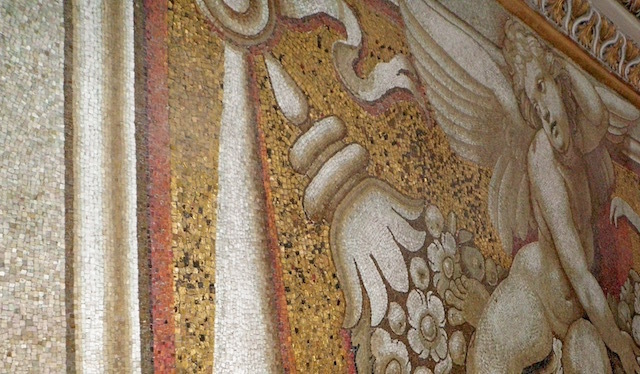 You can stop here and admire the fabulous gold mosaics that adorn the walls. Not worth thinking too deeply about where the gold came from mind you!